Book a Ba Na Hills admission ticket to enjoy your time at the Golden Bridge at your own pace! 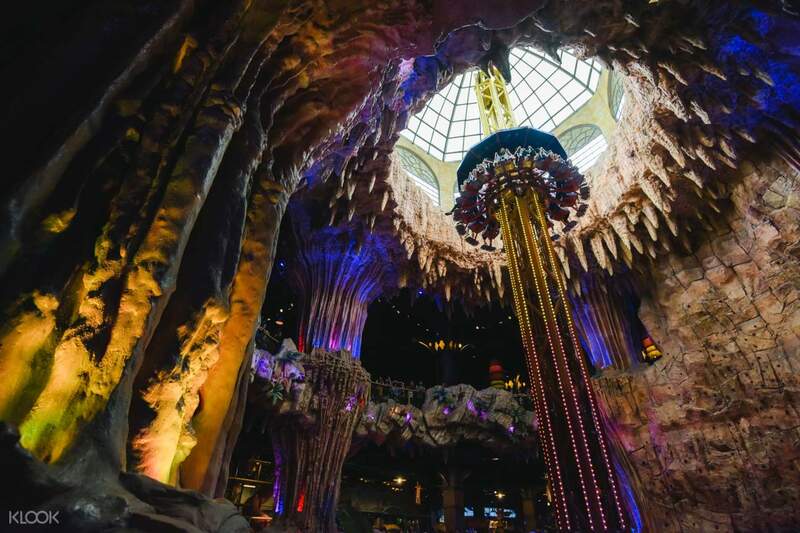 Take photos of the fairytale-like attractions and return home with unforgettable memories! Wonderful experience! Advantages: Amazing scenery and beautiful pictures! All you can eat buffet. Friendly tour guide and driver. Short journey from Da Nang - only 30 to 40 minutes. Entertainment for all ages. Cable car trips aren’t long and you see the fog rolling down the mountains. Disadvantages: Very, very busy, we went on a Tuesday, I can’t even begin to imagine how busy it gets on weekends. Trying to take photos on the golden bridge was a nightmare because of the crowds of people with selfie sticks. The buffet was tailored more towards an Asian audience (not necessarily a bad thing if you love Asian food, but more diversity would be nice) and the quality of the food was sub-standard. If you want to ride the roller coasters, you won’t have time to do anything else due to the massive queues. I stood in line for 10 minutes and barely moved an inch, there was at least 150 people before me. The wax museum is not worth the admission ticket. Next time I’d only book the tour and buffet. The advantages far outweigh the disadvantages and the overall experience was fantastic. Wonderful experience! Advantages: Amazing scenery and beautiful pictures! All you can eat buffet. Friendly tour guide and driver. Short journey from Da Nang - only 30 to 40 minutes. Entertainment for all ages. Cable car trips aren’t long and you see the fog rolling down the mountains. Disadvantages: Very, very busy, we went on a Tuesday, I can’t even begin to imagine how busy it gets on weekends. Trying to take photos on the golden bridge was a nightmare because of the crowds of people with selfie sticks. The buffet was tailored more towards an Asian audience (not necessarily a bad thing if you love Asian food, but more diversity would be nice) and the quality of the food was sub-standard. If you want to ride the roller coasters, you won’t have time to do anything else due to the massive queues. I stood in line for 10 minutes and barely moved an inch, there was at least 150 people before me. The wax museum is not worth the admission ticket. Next time I’d only book the tour and buffet. The advantages far outweigh the disadvantages and the overall experience was fantastic. Nice arrangements for whole tour. Lovely place to visit. This is a must visit point in Da Nang. When I show my photo in public media, all my friends ask me what have I been. And some of them come here just few weeks later. Nice arrangements for whole tour. Lovely place to visit. This is a must visit point in Da Nang. When I show my photo in public media, all my friends ask me what have I been. And some of them come here just few weeks later. Most unforgettable experience ever! Everything id worth every penny! The only downside is the hotel pick up in which we waited for about an hour, all in all experience is superb. Everything is well organized . From the cable car, golden bridge, and fantasy world. Better to include lunch buffet if you’re planning for this tour since it was very cheap and so worth it. What else I can say? Everything is perfect! Most unforgettable experience ever! Everything id worth every penny! The only downside is the hotel pick up in which we waited for about an hour, all in all experience is superb. Everything is well organized . From the cable car, golden bridge, and fantasy world. Better to include lunch buffet if you’re planning for this tour since it was very cheap and so worth it. What else I can say? Everything is perfect! Very good day tour to visit golden bridge and bana hills. The guide contact a day before via WhatsApp for exact pick up time and the bus arrive on time to pick up directly from hotel. The guide Mr. Ling very good and professional and arrange the entire tour nicely! The tour also include buffet lunch at Beer Plaza, many local food to taste! The tour also include the theme park games & coaster ride! Excellent! Very good day tour to visit golden bridge and bana hills. The guide contact a day before via WhatsApp for exact pick up time and the bus arrive on time to pick up directly from hotel. The guide Mr. Ling very good and professional and arrange the entire tour nicely! The tour also include buffet lunch at Beer Plaza, many local food to taste! The tour also include the theme park games & coaster ride! Excellent! It was an amazing trip. The tour guide was nice and very informative. I would highly recommend this trip. Was hoping that it would finish abit late. But still worth it. 🙏🏼 And oh! The lunch buffet is a must! It was an amazing trip. The tour guide was nice and very informative. I would highly recommend this trip. Was hoping that it would finish abit late. But still worth it. 🙏🏼 And oh! The lunch buffet is a must! Really good day - tour guide was excellent. Lots of free time to just roam around Ba Na Hills. Cable Cart included to go up to the hills + once you get up there the bridge is there loads of different gardens to see. We did not get the buffet option so just bought our own lunch while up there. Then the next level higher is a French village and lots of Amusement games which are mostly free. Really good day would recommend this trip with Klook! Really good day - tour guide was excellent. Lots of free time to just roam around Ba Na Hills. Cable Cart included to go up to the hills + once you get up there the bridge is there loads of different gardens to see. We did not get the buffet option so just bought our own lunch while up there. Then the next level higher is a French village and lots of Amusement games which are mostly free. Really good day would recommend this trip with Klook! 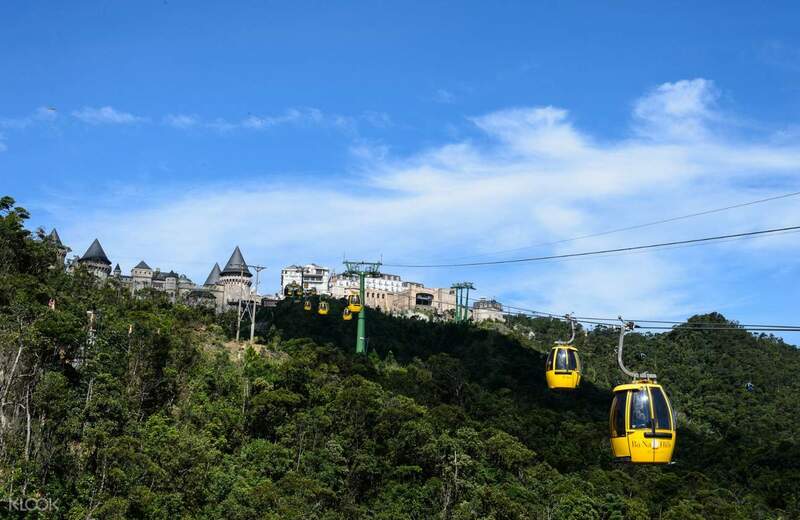 This excursion is very good value at USD37 - the entry ticket to Ba Na alone is USD30. Ling was a great host for the day, arrived on time and was friendly throughout. 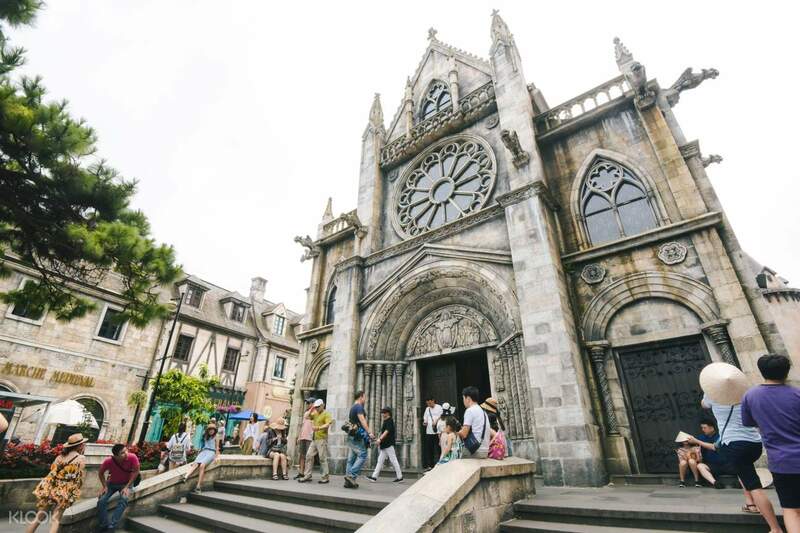 Ba Na Hills itself is very commercialised and full of faux French architecture. However the cable car ride and views make this a worthwhile trip. It is VERY crowded and all tour buses seem to arrive at about the same time (09:30-10:00). I went midweek when they usually get 12,000-15,000 visitors. I would definitely avoid the weekend when numbers can reach 40,000. 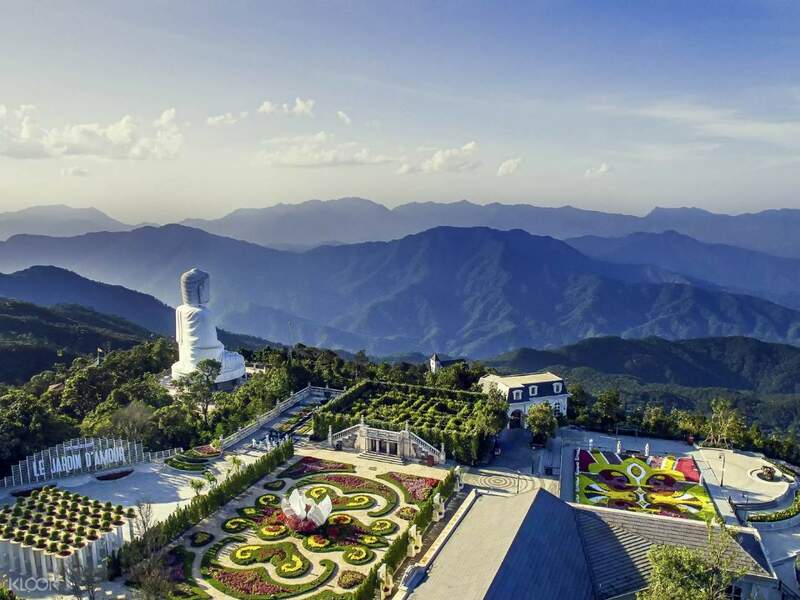 This excursion is very good value at USD37 - the entry ticket to Ba Na alone is USD30. Ling was a great host for the day, arrived on time and was friendly throughout. 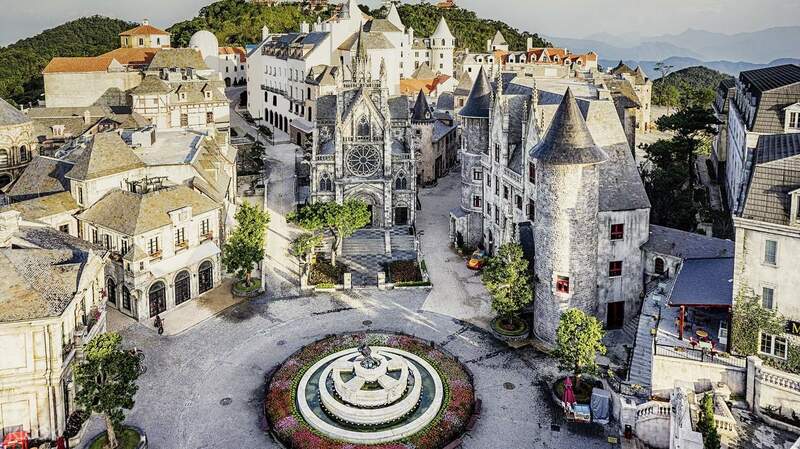 Ba Na Hills itself is very commercialised and full of faux French architecture. However the cable car ride and views make this a worthwhile trip. It is VERY crowded and all tour buses seem to arrive at about the same time (09:30-10:00). I went midweek when they usually get 12,000-15,000 visitors. I would definitely avoid the weekend when numbers can reach 40,000. Wonderful place.. Beautiful structures.. Except too many people.. It would be better if we visit the Golden Bridge after bana Hill.. Coz when we are leaving.. It was clearly less crowded.. Better chance to take a good photo.. Wonderful place.. Beautiful structures.. Except too many people.. It would be better if we visit the Golden Bridge after bana Hill.. Coz when we are leaving.. It was clearly less crowded.. Better chance to take a good photo..
Well organized tour, with free cable car pass. The included lunch buffet is pretty diverse and good quality. We didn't bought a ticket for the wax museum, giving us ~3h in the French village. That was a bit too much and having known about the cable car free pass sooner, would have agreed with the guide to meet downhill and visit more of the attractions located at different stations. Well organized tour, with free cable car pass. The included lunch buffet is pretty diverse and good quality. We didn't bought a ticket for the wax museum, giving us ~3h in the French village. That was a bit too much and having known about the cable car free pass sooner, would have agreed with the guide to meet downhill and visit more of the attractions located at different stations.